Due to impending weather, the Touchstone Energy (West) ElectroRally scheduled for this Thursday has been rescheduled for Thursday, April 18, 2019, in Hoisington, Kansas. Kansas high school teams design, build and race electric vehicles (EV). The EVs are single-driver, lightweight, aerodynamic, high efficiency, electric race cars with three or four wheels of 16" diameter or larger. The EVs are powered by deep cycle lead acid battery packs with a maximum weight of 64 pounds. The ElectroRally competition is based on time and distance, and the race is won by the team that completes the most laps in one hour. Strategy is as important as speed - drive fast to do many laps or go slower, conserve battery and last the whole race. These EVs can reach speeds in excess of 30 mph and travel a distance of 25 miles in the one hour period. Most Kansas ElectroRally teams build their cars from the ground up using lightweight components such as aluminum frames and bicycle wheels. Motors and controls are generally smaller versions of the same technology used in full size EVs. 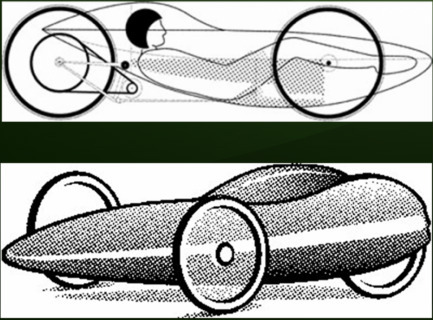 With only a few rules and guidelines, the student teams are allowed much flexibility in the design and composition of their vehicles. First year teams race in the novice class which only includes teams with no previous race experience. The advanced class includes teams with previous race experience. The upper picture to the left is a drawing of an interior design. The lower picture to the left is a drawing of the exterior design. Photographs throughout this site show actual cars that have raced in the past.